Phil Klein pitched for the Rangers and Phillies from 2014 to 2016. In 40 games he went 2-3 with a 5.50 ERA, striking out 54 batters in 55.2 innings. He kindly answered my questions about baseball cards. "I have had a few cards of myself, but they were mostly from the minor leagues, I think I had one big league card and it was a rookie combo card with another pitcher from the Indians. My family enjoyed getting every card I’ve been on but I’m not one to toot my own horn and collect my own cards. I did collect them when I was a kid, I still have them at the house. My favorites were ironically non-pitchers....Jeff Bagwell, Griffey, etc. 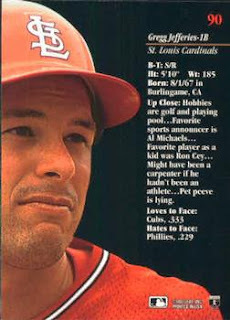 My favorite was probably Jim Edmonds! My grandpa is the worlds biggest Cardinals fan so that’s where that comes from. I loved watching Edmonds play the outfield growing up. Amazing glove, and had the sweetest lefty swing (case can be made for Griffey). That same grandfather is a huge baseball fan, he has some really cool older vintage cards. He was a lefty pitcher and actually went to some major league tryouts when he was younger. " I do this every year. They're usually not very good but they're fun. The off-season was so sleepy that most teams' fortunes have not changed much; I picked the same six division winner that I did last year. So I'll use the same photos I used last year, as a reminder that I still have hundreds of cards from 2002 Fleer Maximum to trade. I'll always pick the Yankees and there is a lot of optimism because they picked up one big hitter, though I'm still nervous because the starting rotation is kind of creaky and the rookie manager does not inspire confidence. The Red Sox picked up a slugger almost as good as Stanton, and their rookie manager is probably more well regarded, though their starting staff has lots of question marks too. This division is going to be a real dogfight. Hard to believe no-one wanted Jose Bautista. If the Yankees have early outfield injuries he would make a lot of sense for them. Blue Jays still have a lot of big bats in their lineup. Biggest intrigue this season will be if they trade Manny Machado. Go ahead, try to name a Tampa Bay Ray other than Chris Archer. They won't win the division by 17 games again this year, but they should still repeat as AL Central champs. There is still most of the core of a team that won the World Series just three years ago. I wouldn't count them out yet. They've been scrappy overacheivers for a couple of years now, but will come back to Earth this year. Picked them fourth because they are a little farther along the rebuilding process than Detroit. Rebuilding team in a surprisingly tough division, could lose 100 games. They were the best team in baseball early on, never really stumbled and won the World Series with a young team that could be even better this year. 110 wins in a weak division where no-one else had a winning record is not an unreasonable prediction. There is some good talent, though not a lot of depth, on this team. Will challenge for a wild card. I'm not buying the Ohtani hype. One aspect of having such a quiet off-season is that teams haven't changed their trajectory that much. Usually there will be a handful of teams that make major upgrades in the off-season but that really wasn't the case this year. A team like the Mariners that might have make a couple of big free-agent signings and a trade instead did almost nothing to improve on their 78-win season. The A's didn't make moves either, but then they rarely do. What will Bryce Harper be like in a free agent year? There is a lot of young talent on this team; they could take a weak division. The above comment for the Braves could apply to the Phillies too, though their talent is a little farther along and some of it has performed below expectations. Hard to believe they won the pennant three years ago. Even if the pitchers stay healthy there is not a lot of offense here. They won't be as bad as everyone seems to think; they won't be very good either. Cardinals are my National League team; I'll always pick them. The Brewers did revamp their outfield; pitching staff still looks shaky but if they come around they could sneak past the Cubs. The Cubs went from 103 wins to 92 last year; a similar slide puts them at a .500 team. Lots of pitching questions here. This is a team like the Mariners that are standing pat with a mediocre team. They traded their best player to the Giants for peanuts. They deserve to be last. Sometimes a team that loses a very close postseason series comes back the next season extremely locked in an blows everyone away. We'll see if the Dodgers are one of those team. They will be a formidable opponent to LA, but they have more pitching question marks, plus have to replace the production JD Martinez brought to them. They spent a lot of money on their bullpen, but is the rest of the team good enough to improve on last year's 87-win team? This is a surprisingly good division. Longoria and McCutchen still have plenty of gas in the tank, enough to make this team interesting. Hosmer is good but he's not that good. In a different division they might be more competitive but here they don't stand a chance. 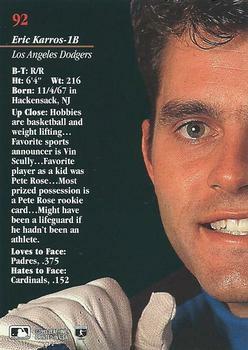 Hobbies are basketball and weight lifting: Shortly after this card was published, Karros blamed weightlifting for his slow start to 1993 and changed his lifting approach. Favorite sports announcer is Vin Scully: Probably hard for a Dodger not to choose Scully. Favorite player as a kid was Pete Rose: They are now co-workers as Fox baseball analysts. Most prized possession is a Pete Rose rookie card: I always enjoy seeing ballplayers collecting. Might have been a lifeguard if he hadn’t been an athlete: Karros did not go into lifeguarding after his career. Where he is now: In addition to Fox he has recently coached a youth baseball team in Manhattan Beach, CA. Favorite sports announcer is Chris Berman: Berman called him Jose “Mother” Guzman. Favorite player as a kid was Roberto Clemente: Guzman was nine when the Puerto Rican baseball legend was killed. 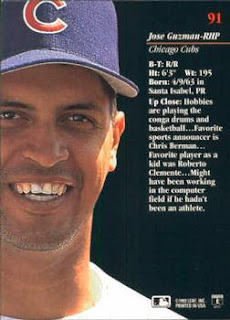 Might have been working in the computer field if he hadn’t been an athlete: He did not go into computers after his baseball career. Where he is now: He is the founder of the Guzman 23 Foundation, which provides financial assistance to those suffering from Alzheimer’s disease, their families or loved ones. 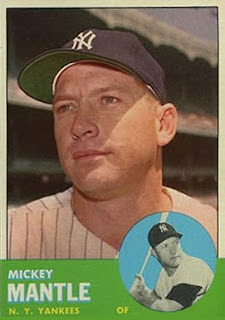 He shared his thoughts on baseball cards with this blog in 2014. Hobbies are golf and playing pool: Remember that famous picture of Jefferies swinging a bat in a swimming pool? Not that kind of pool but it’s the first thing I thought of. Favorite sports announcer is Al Michaels: Solid national choice. Favorite player as a kid was Ron Cey: Despite growing up in northern California Jefferies was a Dodger fan. Might have been a carpenter if he hadn’t been an athlete: Jefferies did not go into carpentry after his baseball career. Pet peeve is lying: He must have hated those dysfunctional Mets teams. Where he is now: Hitting instructor at The Office Sports Academy in Anaheim. 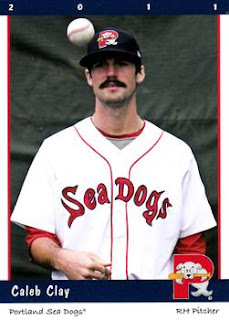 Caleb Clay pitched nine seasons of professional baseball, mostly in the Red Sox organization. In 182 games he went 37-47 with a 4.46 ERA. He kindly answered my questions on baseball cards. "I do not collect but my favorite one of mine is my Portland Sea Dogs team card. We all grew out mustaches and they were awesome!" Mark Gubicza pitched fourteen seasons in the major leagues, thirteen of them with the Royals. A two-time all-star, he won 132 career games, including 20 in 1988, and had a 3.96 ERA. Now an announcer for the Angels, he kindly answered my questions about baseball cards. "I have been a collector all my life. I love the card where I look like Jaromir Jagr with the long hair. Also the card that has me with a batting glove on underneath my glove. Clearly I was never a hitter but it gave me cred as a hitter. Haha"
It refers to a record-breaking tree-planting event. There were lots of extras (including an extra Trees in India) so if someone needs cards from these sets let me know. Less than a week until Opening Day! 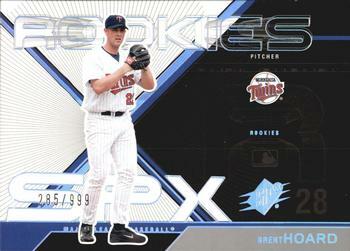 Brent Hoard pitched in the Twins organization from 1998 to 2003. In 133 games he went 41-37 with a 3.94 ERA. Now an attorney in the privacy and cybersecurity practice at the law firm Fenwick & West, he kindly answered my questions about baseball cards. Being on a baseball card was the realization of a childhood dream. In 2003, I remember walking into a gas station that was selling Upper Deck packs. After looking at the display, it sunk in that I could buy a pack and might find one of my own cards. It was an incredible experience that brought back many fond memories of opening wax packs with my brother. I have always liked my 2003 SPx Spectrum Rookies card from Upper Deck. I used to be an avid collector, but my career and family are at the forefront now. I’m excited to share my collection with my girls when they are a bit older. Brian Grant pitched in the Blue Jays organization from 2002 to 2005. In 43 games he went 6-14 with a 4.72 ERA. Now the owner of Industry Supply Inc. in North Carolina, he kindly answered my questions about baseball cards. 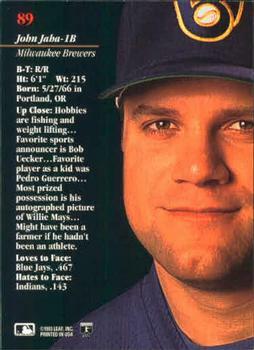 "My favorite card of myself is probably my 2002 Upper Deck Prospect Premier. It was a great moment in time for me. I look 12 years old in the picture but that’s OK.
My favorite card is actually gonna be a basketball card unfortunately. 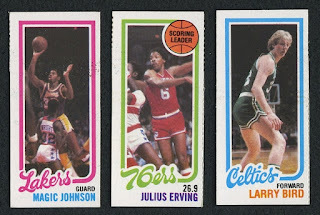 It’s the 80-81 Topps Larry Bird / Magic Johnson RC. 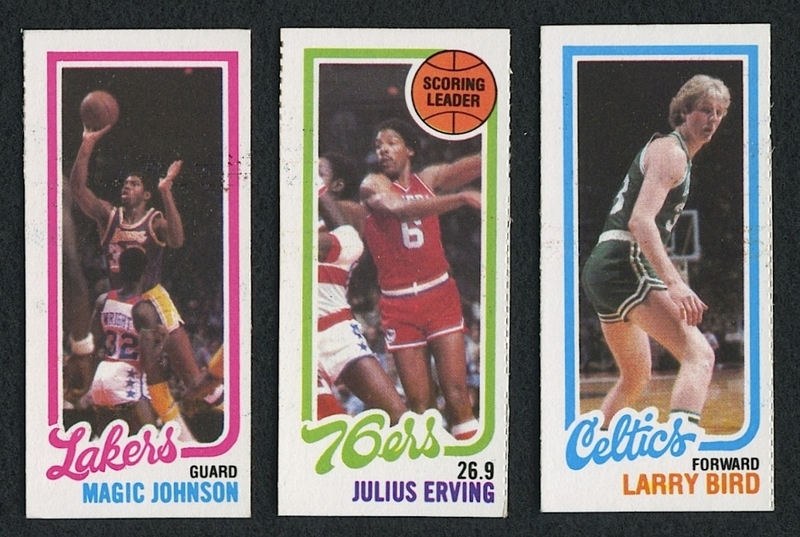 Bird, Johnson, Erving on the card. 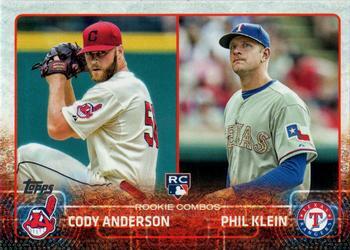 3 of the best ever on 1 rookie card. Amazing card. My oldest brother Bob bought his home with baseball, basketball, and football cards. He actually auctioned a lot of his PSA 10 stuff on memory lane and did well. He bought an 86 Jordan sticker at a trade show here in Raleigh once for 50 bucks in the early 2000s. Sent it in to PSA and it came back a 10 along with some other 9s. He ended up selling that card for 17k to mike high about 1 year later maybe around 2002-03. Amazing what the hobby was at one point. I kind of wish it were really strong again. His favorite baseball card is the 63 Mantle. I still have some cards and will collect here and there when I get the fever but when you have a kid and a wife they kind of take the driver's seat and there isn’t much time for that stuff anymore!" 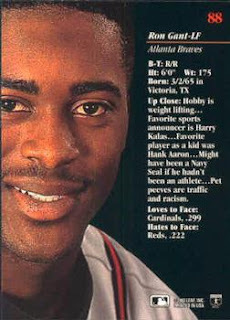 Hobbies are fishing and weight lifting: Jaha was asked to stop weight lifting by the Brewers after an injury to his shoulder. Favorite sports announcer is Bob Uecker: Both Jaha and Uecker are members of the Brewers Wall of Honor. 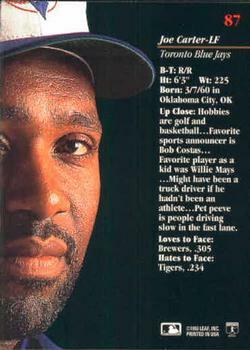 Favorite player as a kid was Pedro Guerrero: Jaha was 14 when Guerrero was a rookie – not really a “kid” at that point. Most prized possession is his autographed picture of Willie Mays: Cool to see a piece of memorabilia being picked. Might have been a farmer if he hadn’t been an athlete: Funny thing is he is not actually a country boy – he was born in raised in the city of Portland, OR. Where he is now: Operates Jaha Baseball in Portland. Hobby is weight lifting: During his career he was considered to have the biggest arms in baseball. Favorite sports announcer is Harry Kalas: Kalas was a longtime Phillies announcer. Gant would play for the Phillies later in his career. Favorite player as a kid was Hank Aaron: Aaron tutored Gant on hitting during his time with the Braves. Might have been a Navy Seal if he hadn’t been an athlete: Gant is a gun collector who was also interested in a career with a SWAT team. Pet peeves are traffic and racism: Gant has said that part of why he idolized Aaron was his bravery in the face of racism during his pursuit of Babe Ruth’s home run record. Where he is now: Co-anchor of Good Day Atlanta. Hobbies are golf and basketball: Since 2010, the Joe Carter Golf Classic has raised and pledged $2,500,000 to benefit the Children’s Aid Foundation and other children's causes. Favorite sports announcer is Bob Costas: Solid national choice. Favorite player as a kid was Willie Mays: Carter got to meet Mays when he played for the Giants. Might have been a truck driver if he hadn’t been an athlete: Carter’s father was a truck driver and service station operator. Pet peeve is people driving slow in the fast lane: Sounds like a truck driver complaint. Where he is now: Involved in various charitable endeavors such as the golf tournament.